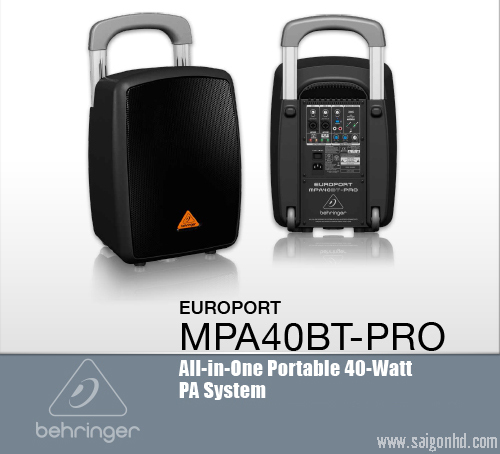 The Behringer Europort MPA40BT-Pro All-In-One Portable Bluetooth Enabled PA System is designed for live sound reinforcement applications. 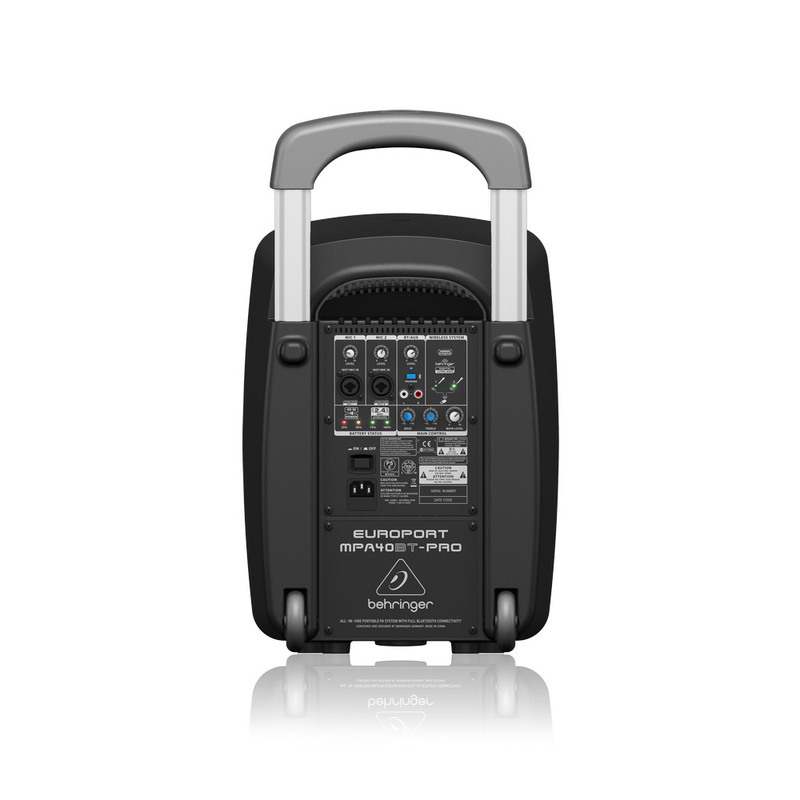 The speaker can be powered by an AC power cord or by the built-in rechargeable battery with a run time of up to twelve hours and four LED status indicator lights. For energy management, it utilizes a low consumption switching power supply. 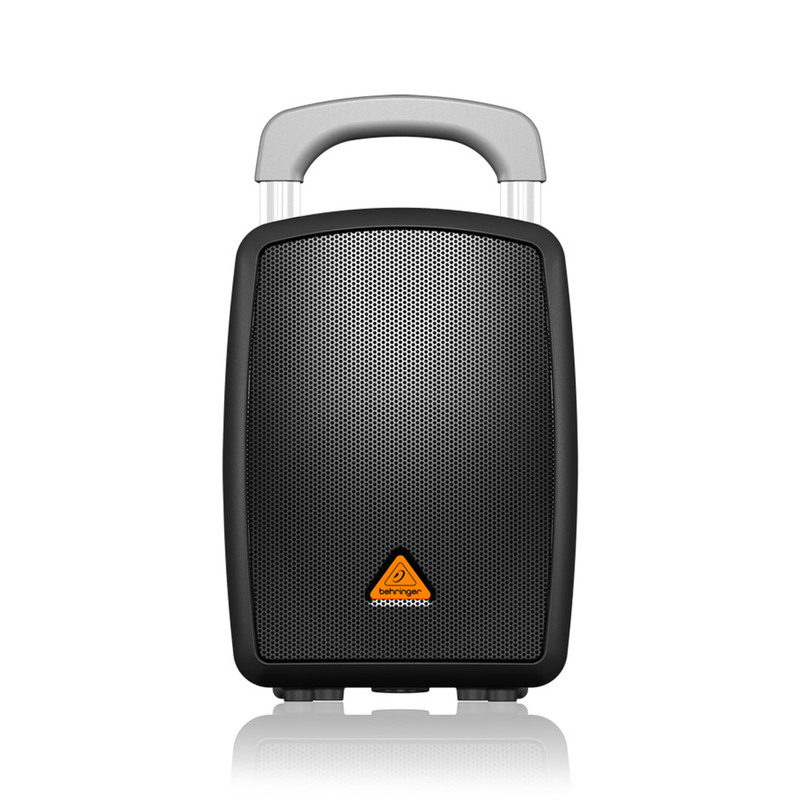 The unit features an 8" full range woofer that is powered by 40W of Class D amplification. A built-in 2.4 GHz Bluetooth receiver allows you to stream music to the PA system from smartphones, tablets, computers, and other Bluetooth enabled devices. 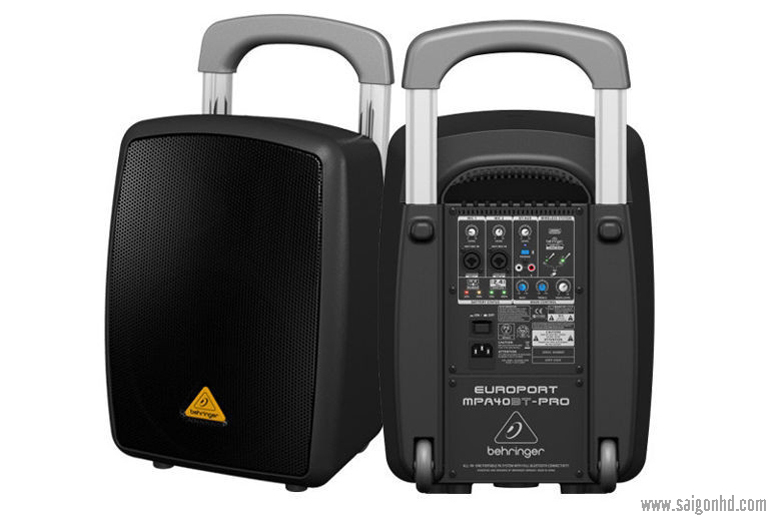 You can also connect up to two Behringer ULM Wireless Microphones using the PA system's USB wireless port and a compatible ULM USB Wireless Microphone Receiver key (sold separately). 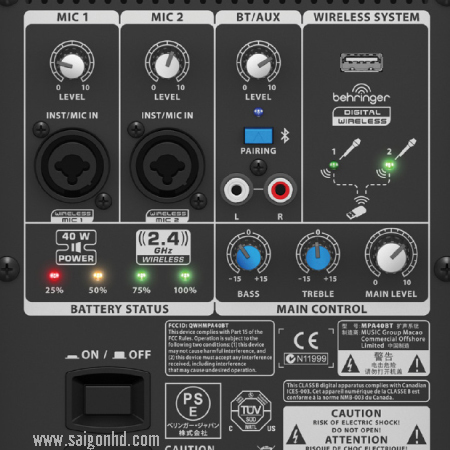 For wired connections, the unit features two XLR microphone inputs with independent level controls. The system comes with one wired dynamic microphone and microphone cable. The PA also features an Aux RCA input pair with independent level control for connecting to a line level source such as a CD player. The output control for the unit features bass and treble controls as well as a knob for adjusting the master output level. A built in 35mm socket on the bottom of the speaker enables mounting the unit on a stand. 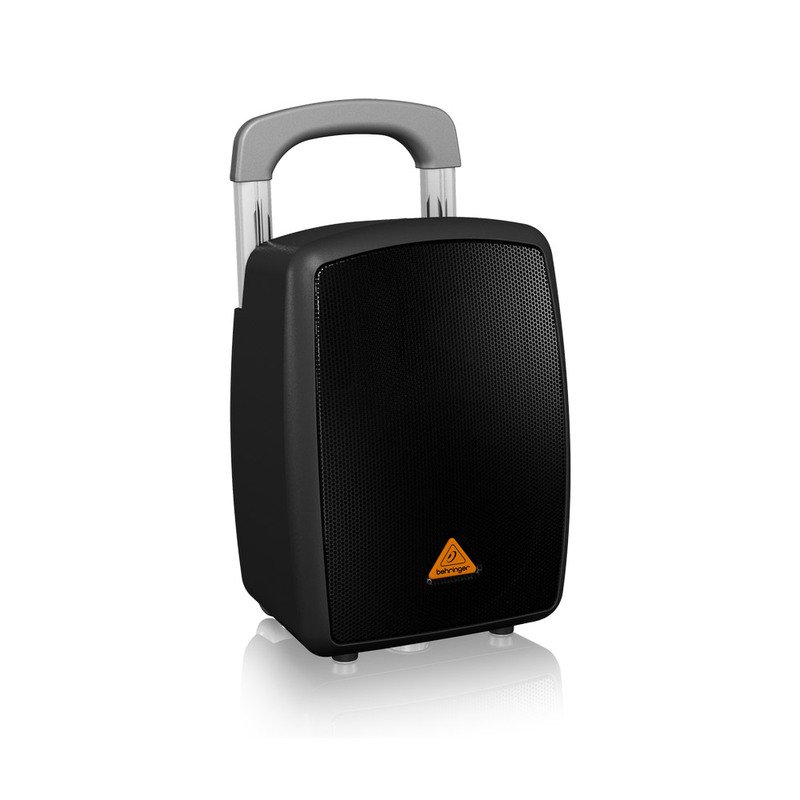 For portability, the pro version of the PA system features built-in rolling wheels and an extendable handle. Portability: Built-in wheels.Built-in extendable handle. Input: 2 x 3-Pin XLR Microphone Inputs. 1 x Aux RCA Pair. Stand Type: 35 mm pole socket. Power Supply: 100 to 240 VAC.